You're thinking about a bridal shower western theme party. She loves horses, feels relaxed in jeans, and often wears cowboy boots. Turn on a country song and she's happy. Then this is a definite possibility. Is he pretty much the same way? Then this could turn into a couples shower.There are so many great western party ideas you can use. So "let's get ready for the big showdown"! *** Do you have an idea for a bridal shower Western Theme Party? Share it! A barn would be a perfect location for a western theme party. A rental hall, large backyard, or open field are also options. Of course, any location can be adapted. Let guests know if they should bring a gift that's related to the bridal shower western party theme. You may also request that guests dress in western wear. Cowboy boots, jeans or ankle length skirts with a white or gingham top, for the girls. Cowboy hats, jeans, big belt buckles, vests and bolo ties, for the guys, are just some of the options. • Your Western party decorations include bales of hay, scattered cactus, and a campfire (real or fake). 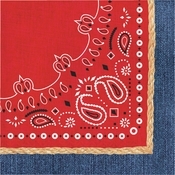 Tables can be covered with red bandanas, gingham or denim. Fill vases with wildflowers for centerpieces. Make up "Wanted" posters or signs, of the bride-to-be or couple, by pasting pictures on poster board. Hang cowboy hats, lassos, and western theme party string lights. Jugs, mason jars, and old barrels complete the scene. • Bridal shower western theme party paper goods. Ranch Snacks: Serve in plastic cowboy hats. • Add a "western" punch recipe...spiked or unspiked. Cut a sheet cake into a simple cowboy boot shape. Ice with vanilla or chocolate frosting. Use decorator icing and your choice of colored sprinkles to complete the look. • Printable games for your western theme party, available immediately. • Western theme party music whether it be boot scootin, square dancing, or toe-tapping will keep things lively. • You may decide to bring in a dance instructor to demonstrate some country moves. *** Start to finish, your bridal shower western party theme will be a hoot! Have a Great Idea for a Western Theme Party? Share it! Have you been to, or planned, a western theme party that was really fun? 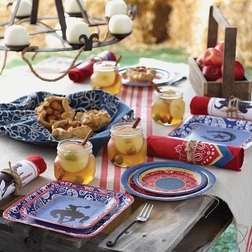 Are you a cowgirl (or boy) at heart, with some party ideas? Share them! Please give your Western idea a title. • Still debating on what bridal shower theme to use? • Go from western theme party page, to Bridal Shower Ideas For You homepage..